Writing with profound psychological and spiritual insight, prize-winning author Gary Zukav has had a major impact on the consciousness of our entire generation. His #1 New York Times Bestseller, The Seat of the Soul, has been a life-changing experience for millions of people around the world. The Seat of the Soul explains how the expansion of human perception beyond the five senses leads to an awareness of our extraordinary creative abilities and the responsibility we have for how we use them, which in turn leads to a new understanding of power —the alignment of the personality with the soul. 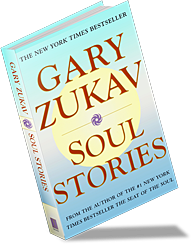 Now in Soul Stories, Gary Zukav shows how creating this new power—authentic power—transforms lives in countless ways. Another New York Times Bestseller, Soul Stories is filled with marvelous stories that show how intuition, harmony, sharing, and forgiveness actually express themselves in our lives. Soul Stories, a delightful book with profound insight, is an excellent introduction to the concepts of authentic power. Especially inspirational for spiritual discussion, Soul Stories can be read at a single sitting or savored one section a week for an entire year. Soul Stories is a wise and wonderfully readable book. Creating authentic power…doesn’t depend on what happens outside of you. It depends on what happens inside. NY Times Bestselling author Gary Zukav is inspiring as he shares accounts of his own personal evolution and the true stories of other people from his engaging book Soul Stories. Discover your own deep truths and the ways that intuition, harmony, sharing, and forgiveness will help you create authentic power in your own life.